The Global Volcanism Program has no activity reports for Kuttara. The Global Volcanism Program has no Weekly Reports available for Kuttara. The Global Volcanism Program has no Bulletin Reports available for Kuttara. The Kuttara volcanic group consists of a series of small stratovolcanoes, lava domes, pyroclastic cones, and a caldera near the Pacific coast SE of Toya caldera and SW of Shikotsu caldera. 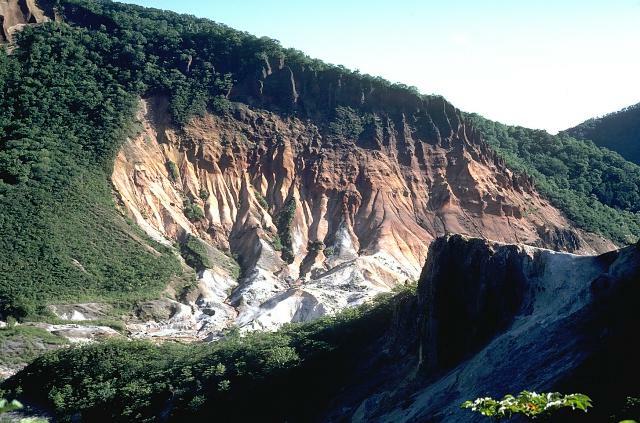 The Kuttara group was constructed during five major eruptive stages, the first of which occurred more than 60,000 years ago. A major dacitic pumice eruption at the end of the 4th stage about 40,000 years ago resulted in the formation of the 3-km-diameter Kuttara caldera. The caldera cut a basaltic-to-andesitic stratovolcano complex, which late in its activity produced two major andesitic lava flows on its north side at Kita-yama. Explosions, probably in early Holocene time, formed two large craters on the west flank of the caldera, and a dacitic lava dome was emplaced about 10,000 years ago. Late-stage phreatic explosion products from Jigoku-dani, a 300-400 m wide crater south of the lava dome, overlie the 1663 tephra from Usu volcano. 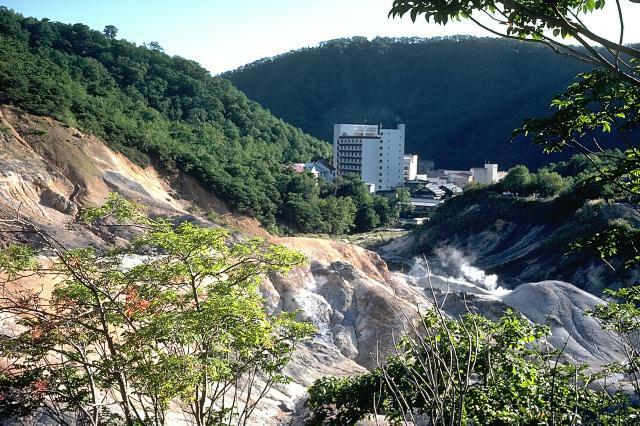 Jigoku-dani and Noboribetsu Spa are the sites of intense thermal activity, including fumaroles, hot springs, and geysers. Katsui Y, Yokoyama I, Murozumi M, 1981. Noboribetsu Spa. In: Katsui Y (ed) Symp Arc Volc Field Excur Guide to Usu and Tarumai Volcanoes and Noboribetsu Spa, Part 3, Tokyo: Volc Soc Japan, p 55-64. Moriizumi M, 1998. The growth history of the Kuttara volcanic group, Hokkaido, Japan. Bull Volc Soc Japan (Kazan), 43: 95-111 (in Japanese with English abs). There is no Deformation History data available for Kuttara. There is no Emissions History data available for Kuttara. Steam rises from the Jigoku-dani thermal area of Kuttara volcano, which contains active fumaroles, hot springs, hot pools, and mud pots. High-rise hotels have been constructed at the Noboribetsu Spa on the western flank of Kuttara. Photo by Tom Simkin, 1981 (Smithsonian Institution). Hiyori-yama lava dome (left) is a dacitic dome that was extruded during late stages of the eruption that produced the O-Yunuma explosion crater in the foreground. The 372-m-high dome is mantled by a thin layer of older sediments and breccias that were striated and baked during uplift of the dome. O-Yunuma explosion crater is 300-400 m wide and is filled with hot water. Large areas of hydrothermally altered ground occur at the Jigoku-dani ("Valley of Hell") thermal area of Kuttara volcano. 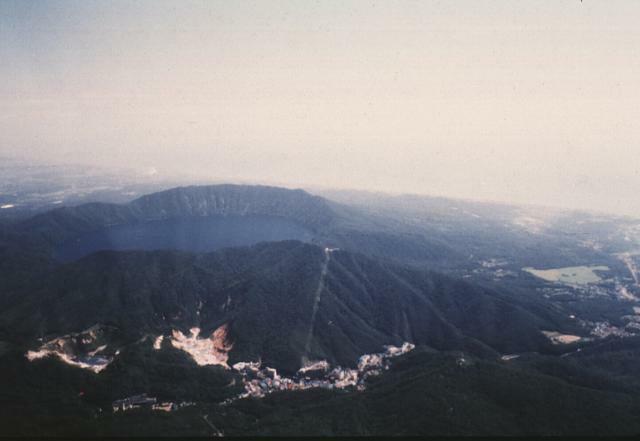 Jigoku-dani is a 300-500 m explosion crater that was formed on the west flank of Kuttara volcano. The major tourist resort of Noboribetsu Spa is located nearby. 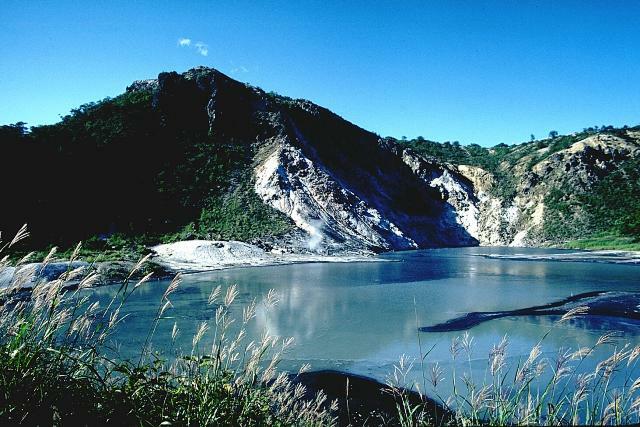 Lake Kuttara fills the 3-km-wide Kuttara caldera, which was formed during major late-Pleistocene explosive eruptions. Pumice-rich pyroclastic-flow deposits from this eruption blanket a wide area around the volcano. Post-caldera volcanism has constructed a group of explosion craters and a lava dome on the western flank of the caldera. The latest eruption consisted of a phreatic explosion from one of the west-flank craters that postdates the 1663 eruption of nearby Usu volcano. Photo by Mihoko Moriizumi, 1995 (Hokkaido University). Kuttara volcano, seen here from Shiraoi town, is a low, 581-m-high stratovolcano that is truncated by a 3-km-wide caldera. 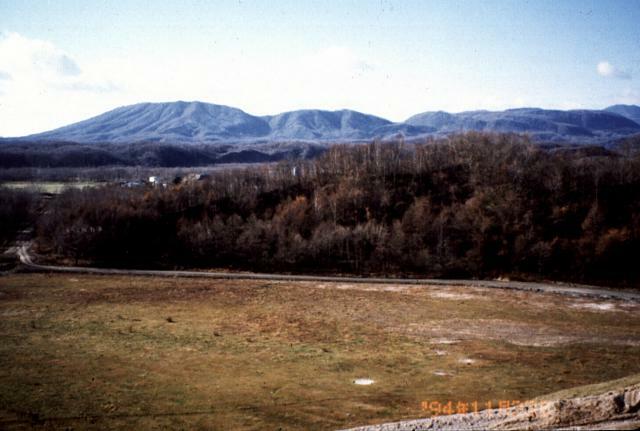 The caldera formed during the late Pleistocene, but minor explosions occurred from a crater in a west-flank thermal area as recently as about 200 years ago. 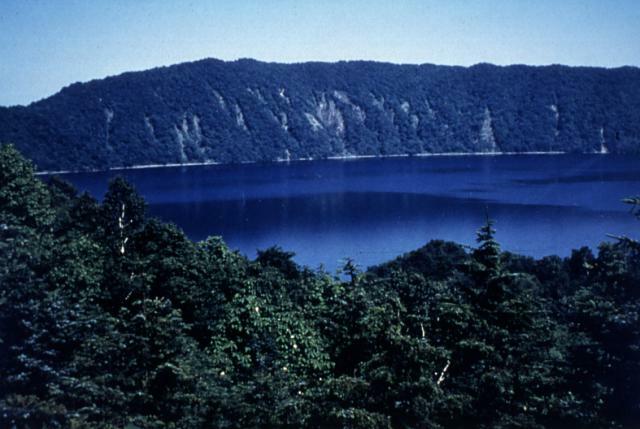 Kuttara volcano, seen here in an aerial view from the west, consists of a 3-km-wide, lake-filled caldera near the Pacific coast of Hokkaido. Post-caldera eruptions have produced a series of explosion craters on the west flank. Thermal activity associated with these craters has produced large areas of hydrothermally altered ground seen at the bottom of the photo. The resort town of Noboribetsu Spa is visible at the lower center. Photo by Yoshio Katsui, 1996 (Hokkaido University). 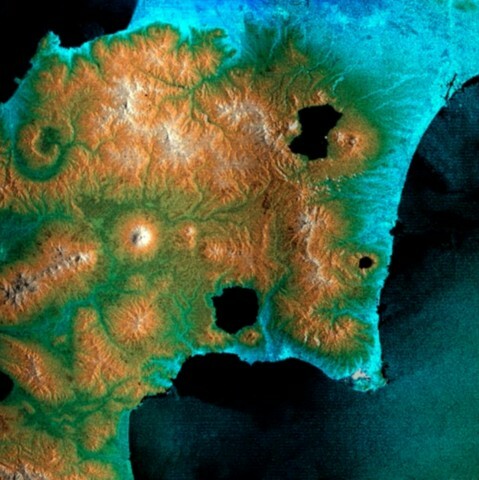 Volcanoes and calderas fill much of this NASA Shuttle Radar Tomography (SRTM) image of southern Hokkaido with north to the upper left. Usu volcano (bottom center) lies south of Toya caldera. The smaller caldera to the right along the Pacific Ocean is Kuttara. Tarumai and Eniwa volcanoes lie on the estern and western sides, respectively, of Shikotsu caldera (upper right). The conical white peak at left-center is Yotei volcano; Niseko volcano is along the ridge to its left. The city of Sapporo lies at the base of the mountains (top-center). NASA Shuttle Radar Tomography Mission image, 2000 (http://earthobservatory.nasa.gov/). Large Eruptions of Kuttara Information about large Quaternary eruptions (VEI >= 4) is cataloged in the Large Magnitude Explosive Volcanic Eruptions (LaMEVE) database of the Volcano Global Risk Identification and Analysis Project (VOGRIPA).